Grant Shoaf and Tony Strain-Flores of Mechanics Bank will help you identify and avoid falling victim to the many types of fraudulent schemes that they have seen over the years. Dr. Steven Pantilat, distinguished director of the UCSF Palliative Care Program and author of numerous publications about living with serious illnesses, will introduce and lead a discussion of this original Netflix documentary. This compelling and compassionate film chronicles the experiences of several patients, their families and their extraordinary doctors with palliative care. Presentation starts at 2 PM ! In this interactive presentation, Sara Z. Geber, author, Ph.D. in Counseling, financial planner and certified retirement coach, invites you to learn what to consider as you weigh your options and make decisions to create a fulfilling life as you age -- identifying what matters to you most, and finding resources in lieu of family to provide what you will need. For this project we will wash and clean member's windows. For this project we will help clean up member's yard. Volunteer B'Cause Save the Date! Volunteer B'Cause is assisting in fund-raising for the Alzheimer's Association. 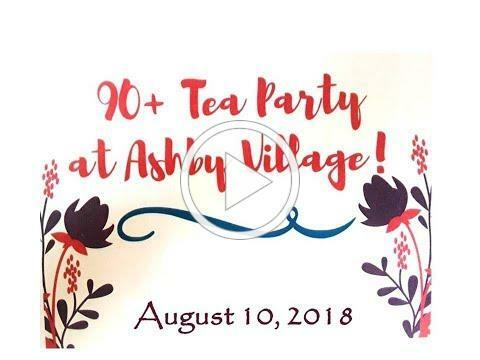 Registered walkers on our AV team will receive an Ashby Village t-shirt. Enjoy these two popular fairs and stop by our booth! Solano Stroll features a parade, food, crafts, rides and more! Come find our booth in front of 1737 Solano Avenue just below Ensenada. Bring your friends to say hello before taking advantage of all the delicious food, music and dance performances, and fun for the little ones, at the 2018 Rockridge street festival. Have you ever wondered what motivates Ashby Village Executive Director Andy Gaines? Learn how his search for a home facilitated a building of bridges and deepening of community between Ashby Village and Park Hills. The best camera is the one I always have with me! Celie Placzek writes about some often surprising uses of her smartphone camera, in the last narrative-style entry from the Tech Team. In the future, the team will offer practical how-to guides. Eleven group members lunched together in mid-August to talk over building neighbor-hood camaraderie and to consider future directions and desired interest groups. A second gathering to identify interest group leaders and schedule future meetings will be held at the Ashby Village office on Tuesday, October 9 at 2 PM. Members are invited to contribute their expertise and energy to the future of Northtowns. Tuition $35, payable to the Berkeley Adult School. or call her a t 510-735-9580. The Fall Prevention Class is back by popular demand! A great class that teaches exercises and provides educational information to help you stay "upright." 12 people maximum. No fee, but you must make a commitment to attend all 8 sessions. To register or for more information, call Roberta Pressman at 510-735-9580. Susan or call her at 510-499-2841 to register. Sunday, September 16, 2-4:30 PM: Documentary Film Screening at Clarewood: "Finding Vivian Maier." RSVP to Mary Goldstein. Monday, September 17, 7-9 PM: Nonfiction Book Club in Emeryville. RSVP to Tobey Klein. experiments in this new stage of life. RSVP with Don Hubbard. Tuesday, September 25, 2-3:30 PM: Technology Committee Meeting at Ashby Village, 1821 Catalina Ave., Berkeley (accessible!). Are you skilled and interested in technology? Interested in sharing your skills? RSVP to Maryl Gearhart. Susan D. Anderson addressed a full house on the topic "Liberty Loving People: African American Freedom Networks and the Struggle Over Slavery in California." Her talk shed light on the little-known existence of slavery in California, and the forms that resistance to slavery took. Maryl Gearhart of Ashby Village's Tech Team has compiled a list of one-time and ongoing technology and computer classes offered at Senior Centers in Albany, Berkeley, El Cerrito and Emeryville. Are you interested in earning some extra cash from your spare bedroom, at the same time providing affordable housing to UC Berkeley graduate students? UC Berkeley Retirement Center and Ashby Village are lead partners in a pilot program seeking to match six Berkeley senior homeowners with six UC Berkeley graduate students this year.